Ginko, originally uploaded by trekr. It rained again this afternoon. 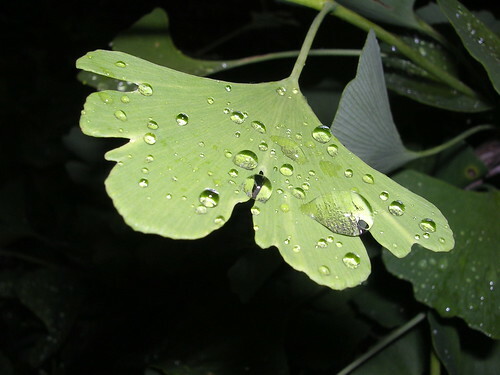 The Ginko leaf cradles a few drops that will fall as the breeze lifts the limb. This entry was posted on Monday, May 14th, 2007 at 7:22 pm	and is filed under Garden. You can follow any responses to this entry through the RSS 2.0 feed. You can leave a response, or trackback from your own site. I really love this photo. I love that Gingko as well. If you remember, I got a small, approximately 1 foot tall tiny little gingko tree about 6 or 7 years ago, and I planted it and left it alone, and now it is only maybe 12 feet high, but it is ephemeral. Talk about withstanding the test of time – the supertough gingko is prehistoric and beautiful, all in one lovely, lacy package.